He was the first one from the Genesis camp to endeavour a solo career even though he still was a member of the band. It must have been in 1973 that initial frustration occurred in the band about the musical direction. Some band members looked for jobs outside the Genesis label, like Rutherford with Hackett’s predecessor Anthony Phillips, or Collins as a session musician (which would, in turn, lead to the formation of his other band Brand X), or like Steve Hackett. He worked on those of his pieces that had not made it into Genesis’ repertoire while it was still very unclear whether and if, how, the band would continue in the time around and after The Lamb Lies Down On Broadway. Hackett’s first six solo records were published between 1975 and 1983 on the Genesis home label Charisma Records. Later they were re-released on CD by Virgin Records when they swallowed Charisma Records. Unfortunately all publishing rights remained with Virgin so that Steve Hackett could not release reworked versions of these records on his on label Camino Records. He had done that with all his post-1983 records in the mid-90’s. When the cult around Genesis kept growing continually and Hackett profited from it by selling his albums very successfully, things changed. In 2005 Virgin Records were not averse to release Hackett’s first four records in reworked form. Sales apparently matched expectations when the discs made it to the stores on October 15, 2005, so there were no obstacles for the release of the ‘leftover’ albums Cured (1981) and Highly Strung (1983) anymore. From January 29, 2007 onwards fans will be able to finally enjoy all solo albums by the former Genesis guitarist in remastered shape. Virgin / EMI Records fortunately left it to the artist to decide who should rework the original master tapes of the recordings. Benedict Fenner proved the right man for the job. He is a long-time pal and connaisseur of Hackett’s work. This ensured that Steve Hackett kept control over the outcome and that nothing would be released he would later have to distance himself from. Tracks: Ace Of Wands / Hands Of The Priestess Part 1 / A Tower Struck Down / Hands Of The Priestess Part 2 / The Hermit / Star Of Sirius / The Lovers / Shadow Of The Hierophant. Recorded on Nov 11, 1979 at Theatre Royal Drury Lane, London, UK. This is obviously not a recording from the period immediately after the album’s release. 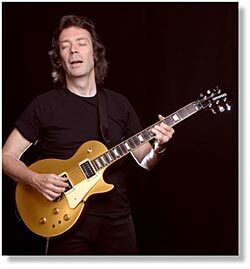 Steve Hackett did not play concerts to promote his debut so that there is no live material. The lineup consisted of flutist/guitarist John Hackett, keyboarder Nick Magnus, bass player Dik Cadbury, drummer John Shearer and vocalist Pete Hicks. At the time the band usually played a shortened version of the piece and combined the second half with Racing In A. This is identical with the regular album version until the closing part (5:54 onwards), but then the closing section was kept in its original form. That means not cuts – tension builds for five more minutes towards the climax. The best bits of the long version were combined to make up the album version. The tape that holds this version of the Hackett / Rutherford composition was found when Hackett’s father decided to tidy up the garden shed! When the opening song proved a huge favourite with US radio stations it was decided to release the song as a single. The label of vocalist Steve Walsh (then with Kansas) objected, though. Therefore vocal tracks for a potential, slightly shortened 7” version were recorded by John Perry. Despite additional changes in the mix the result was not too convincing. After the production of a promo the single was shelved. Another recording from the Theatre Royal Drury Lane, London (Nov 11, 1979) that had not been available previously. Strictly speaking, this opening song from the 1978/9 shows that was recorded on the next to last show of the Spectral Mornings tour also contains bits of Tigermoth. This previously unreleased version with vocals by Steve Walsh differs from the album version in that it has a different mix and a “natural” end of the song without a fade-out. Percussion and keyboard tracks differ occasionally and little bits like the whistling at the end were left out. This is not the version that was specifically recorded for the single. It is based on the album version, although with a slightly changed mix. Note the hitherto unknown 60 seconds worth of closing section in half time. This mix contains additional guitar tracks and Steve’s harmonica in the chorus. Only the second half of the song surfaces here in another mix. The keyboard has moved to the foreground and some vocal tracks are mixed differently than in the final album version. After an unusual intro featuring vocoder vocals this mix includes a guitar part of Steve’s that had not been included in the first part, a different mix of percussions and shouting in the second part as well as a prolonged end. The eight seconds of noise in the beginning of the track actually have nothing to do with this song but stems from Tigermoth. This classic was robbed of most of the drum solo for the 7” and 12” versions that were released in September 1979. Recorded on June 11 at the Pavillion de Paris, this piece was originally published on the Clocks 12” maxi single. It includes snippets of Lost Time In Cordoba, Etude In A Minor (Carcassi), Blood On The Rooftops as well as complete versions of Horizons and Kim. … someone is ticked off and very vocal about it! This unmusical extra also surfaced as a hidden track on some early pressings of Spectral Mornings. The first ‘real’ non-album track was released as the B-side of the single The Show. It is a surprising track for Hackett because it has unusually fast hard rock pieces, staccato vocals and brief vocoder bits in the briefest of middle parts. This previously unreleased track, like the bonus tracks on Voyage and Touch comes from the gig at the Theatre Royal Drury Lane, London, on Nov 11, 1979. At that time it had not been released at all. These three unreleased live tracks were recorded at the Reading Festival on Aug 28, 1981. It features the Cured tour personnel, i.e. John Hackett (flute, guitar), Nick Magnus (keyboards), Ian Mosley (drums) and Chas Cronk (bass). It is unknown why no recording was chosen for this CD from the 1980 Defector tour ensemble. This track has been released on the flipside of the Hope I Don’t Wake single. Played by Hackett on the nylon string guitar, its core was composed by Mauro Giuilani labelled Andante In C. In the 1950s it was used as the title melody of a children’s TV series. A more recent recording of this piece can be found as the bonus track for the 1994 re-release of the Bay Of Kings album. The duet of classical guitar and flute (played by Hackett’s brother John) became the title track of the eponymous British TV series. It was first released in 1981 as the Picture Postcard b-side before it appeared as a re-recording on Hackett’s first acoustic album Bay Of Kings in 1983. Here is another recording from the Reading Festival (Aug 28, 1981) in addition to the three live tracks on the re-released Defector album. This piece could be heard before on the 12” maxi single of Cell 151 (1983). This short instrumental, a fast rock boogie, was often played in live shows as an encore. The recording is most likely from the tour rehearsals because it features the complete live band from 1983. Though the song is labelled '12” version' here and indeed two minutes longer than on the album, this version (done by Rafe McKenna) did never appear on a maxi single. It may have been intended for one, though, but it was only published on the US album version of Highly Strung. Additional effects and edited parts make this piece the more interesting. Note the closing section with additional keyboards, vocoder, drums and the whistled melody. Steve Hackett wrote this piece with the Genesis reunion on October 02, 1982 fresh in his mind. It was first published on the 7” and the 12” single versions of Cell 151 in 1983. A re-recorded version became the bonus track of the remastered Bay Of Kings in 1994. Virgin / EMI Records have finally seen the light and re-released the early albums to the delight of both the artist and his fans. The new versions stick to Hackett’s ideas and wishes as far as both acoustic outcome as well as packaging and extras are concerned. Who cares if not all the photos and live recordings match the time of the album’s original release. Who cares if there are some minor mistakes about the track lengths given. This remaster series is a godsend for friends of the former Genesis guitarist.